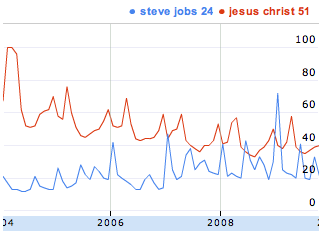 How else to explain this article where he wonders if maybe I’m more popular than Jesus? And puts up the chart from Google Insights that you see above? For what it’s worth, I’ve never suggested that I’m more popular than Jesus. More important? Certainly. More influential? Sure. Smarter, even? I don’t know, because did Jesus take the SATs? And if so, what did he get? I had a pair of 800s, so the best the Son of God could do would be a tie, and then we’re back to square one again. » Vista? We wouldn’t recommend it. » Angry Jesus revokes GOP license, vows to "beat some asses"